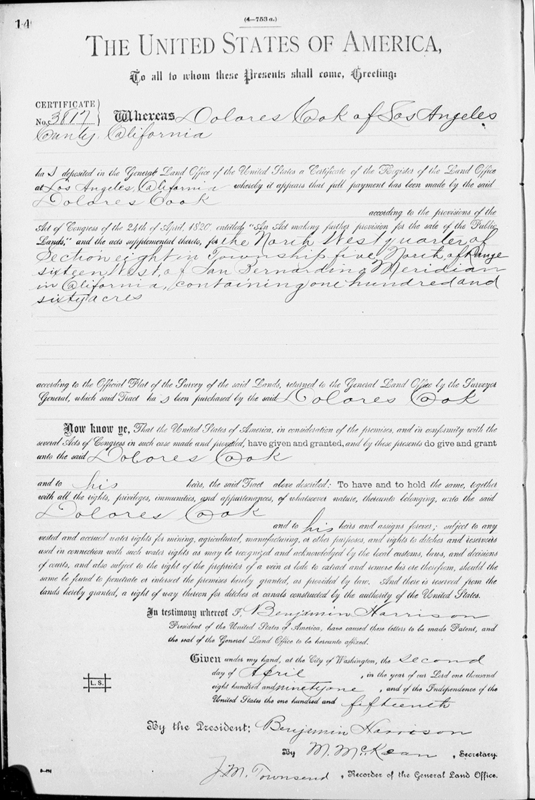 SCVHistory.com LW3396 | Castaic | 160-Acre Land Patent Issued Posthumously to Dolores Cook, 4-2-1891. This innocent-looking slip of paper represents the beginnings of one of the deadliest rivalries in Santa Clarita Valley history — a land war that would sretch out over two and a half decades and claim more than 20 lives. The document is a government patent to 160 acres of land in Castaic issued to Mr. Dolores Cook more than a year after he was murdered. First the particulars: It's not a homestead patent. Homestead patents, usually also for 160 acres, were issued free of charge (after a filing fee) on a first-come, first-served basis under the Homstead Act of 1862 (ff.) to anyone who agreed to farm and build a house within five years. This patent, however, was for land purchased under the Act of April 1820, 3 Stat. 566, which allowed anyone to buy surplus government real estate for $1.25 per acre on credit or installments over four years. Doing the math, Dolores Cook would have applied for the patent and started making payments in 1887. It is somewhat ironic that Cook had to buy land from the U.S. government in the first place, considering his inherent rights to the land predated the arrival of the Americans and the Mexicans and the Spanish colonists before them. His mother, Trinidad Espinoza, was born at the Mission San Gabriel, and her ancestors inhabited the greater Los Angeles area for at least a thousand years. Dolores' wife, Francis Olme, also had California indigenous parentage. Dial up the clock to the 1860s. The U.S. government granted land rights to the Atlantic and Pacific Railroad, which was making designs on pushing west through the Castaic area. (It didn't.) Five years later, the government in its infinite wisdom granted similar rights over the same general area to the Southern Pacific Railroad, which did come through (although at Castaic Junction, not today's Castaic proper). By the 1880s, when it was clear no train tracks were coming to the reserved land in and around the present town of Castaic, the government made the land available for purchase. Enter the two Bills — William Chormicle and William Wirt Jenkins. Both men coveted the same land. Chormicle claimed rights to it under a deal with the Southern Pacific Railroad. Jenkins simply settled on it and started buying it from the government. All the while, the SP was in court with the government trying to restake its claim. It lost. From this document we see Jenkins' partisans were active players in the early stages of the scheme to acquire land. Cook, to our knowledge, was a ranch hand on Jenkins' Lazy Z ranch (now the Stonegate community and part of the DWR Castaic Lake Reservoir). On February 28, 1890, Cook was helping an ally, George Walton, 25, haul some wood on Walton's own piece of land where he was building a house. Chormicle and a third "Bill," Will Gardner, rode by, and a fight erupted between Walton and Chormicle. When the dust settled, both of the Jenkins partisans, Walton and Cook, were dead. In what many even today consider a miscarriage of justice, Chormicle and Gardner were acquitted in a highly publicized murder trial. We know what the newspapers said about the trial testimony, but what really happened that day in February 1890? What was the true impetus? Was it the fact that Walton had property that Chormicle believed was rightly his, and that Cook was only a year away from having legal title to another 160 acres of his own? It's doubtful we'll ever know. We do know the story was about to take a weird twist. No sooner was Dolores Cook's patent granted in April 1891 than it was mixed up in another court battle in May — and it wasn't Chormicle who was at the root of it, but Jenkins. That year, Jenkins formed an oil company with partners who capitalized it to the tune of $100,000. Only it was a swindle. Jenkins recruited the investors by salting wells with oil. Along the way he took advantage of Dolores' widow, Francis, telling her she'd better sell him her 160 acres for $250, or an oil company would come in and claim mineral rights and take it away and she'd get nothing. She believed him. After all, Jenkins and her dead husband had been allies. So she sold. A century after losing their ancestral homelands to conquerors, the family lost its U.S. government land to one man's avarice. Today the 160 acres are under the east arm of Castaic Lake. The yellow square is the northwest quarter of Section 8 of Township 5 North, Range 16 West, S.B.M. — Dolores Cook's land. Click map to enlarge.